Can Something in Young Blood Give a Boost to Old Brains? Infusing blood from younger creatures into older ones in hopes of halting—or even reversing—the aging process may sound like a macabre scene straight out of “Game of Thrones.” However, several scientific studies have shown that when older animals receive blood from younger counterparts, it improves the function of stem cells throughout the body, boosting tissue regeneration and healing. What’s not been clear is whether this activity can also rejuvenate the brain’s cognitive powers. Let’s face it: aging is tough on the brain. The number of neural stem cells shrinks, producing fewer neurons; and many of the genes that promote brain development and neural connections become less active. To find out if young blood might hold some of the answers to this complex problem, two teams of NIH-funded researchers—one in Massachusetts and the other in California—recently turned to mice as a model system. For the West Coast team, led by Saul Villeda of the University of California, San Francisco and Tony Wyss-Coray of Stanford University, the effort began a few years ago with the discovery that when old mice are exposed to blood from young mice, their neural stem cells increase. The opposite was also found to be true: blood from old mice inhibited stem cell proliferation in young brains and hindered certain types of memory and learning . In their new work, the researchers fused the circulatory systems of young mice (3 months old) with that of old mice (18 months old). The procedure, called parabiosis, created a shared blood supply. As a control, the researchers connected the circulatory systems of old mice. After 35 days, the researchers examined the animals’ brains, focusing on the hippocampus—the area essential to learning and memory. In the young-old mouse pairs, exposure to young blood reactivated genes in the older animal’s brain that encouraged neurons to make new connections, which are key to forming memories and learning new skills. Of particular interest was the increased activity of the Creb gene and other plasticity genes known to be very active in developing brains. Through confocal microscopy, researchers observed an increased number of dendritic spines, which are connection points for neurons to chat with each other. And, by measuring the brain’s electrical activity, they found indications of improved communication in the dentate gyrus, which is the input region of the hippocampus . In contrast, no significant changes were detected in the brains of the old-old mouse pairs. Building on those findings, Wyss-Coray, winner of a 2013 NIH Director’s Transformative Research Award, and Villeda, winner of a 2012 NIH Director’s Early Independence Award, set out to see what the biological changes might mean for behavior. First, they injected blood plasma from young mice into old mice every week for eight weeks. Serving as controls were old mice that received either plasma derived from other old mice or young plasma that had been heated (destroying any proteins that might be involved in the blood’s regenerative properties). Then, the animals’ cognitive abilities were put to the test. It turns out that old mice that received young plasma were better than controls at remembering spatial tasks and recalling frightening experiences, showing that their spatial and contextual memory skills had improved. These researchers suspected that the CREB protein, a master regulator of neuronal plasticity, orchestrated a significant number of rejuvenating effects and that something in young blood was ramping up its production. To explore the idea, Villeda came up with a strategy to prevent CREB from responding; sure enough, young blood was then unable to trigger changes in neural architecture or memory in older mice. Meanwhile, the East Coast team, led by Lee Rubin and Amy Wagers of the Harvard Stem Cell Institute, Cambridge, MA, was busy using mouse parabiosis, as well as injections of a protein called growth differentiation factor 11 (GDF11), in their quest to improve their understanding of the rejuvenative powers of young blood. This group had previously isolated GDF11 from young blood and shown that GDF11 injections reduced age-related thickening of the heart in mice. In a new study focused on the brain, Wagers, winner of a 2008 NIH Director’s New Innovator Award, and her colleagues found that either exposure to young blood or daily injections of GDF11 could boost the number of neural stem cells and stimulate the growth of new blood vessels in the subventricular zone of older animals’ brains. The cognitive upside observed in such mice was improved sense of smell . Taken together, these findings from two independent groups raise the tantalizing possibility of protecting, or even restoring, the cognitive powers that tend to slip as people grow older. With more basic, translational, and clinical research, scientists may someday be able to develop treatments—replacing or mimicking the beneficial proteins found in young blood, or blocking the detrimental ones found in old blood—that will allow more and more individuals to experience healthy aging. The ageing systemic milieu negatively regulates neurogenesis and cognitive function. Villeda SA, Luo J, Mosher KI, Zou B, Britschgi M, Bieri G, Stan TM, Fainberg N, Ding Z, Eggel A, Lucin KM, Czirr E, Park JS, Couillard-Després S, Aigner L, Li G, Peskind ER, Kaye JA, Quinn JF, Galasko DR, Xie XS, Rando TA, Wyss-Coray T. Nature. 2011 Aug 31;477(7362):90-4. 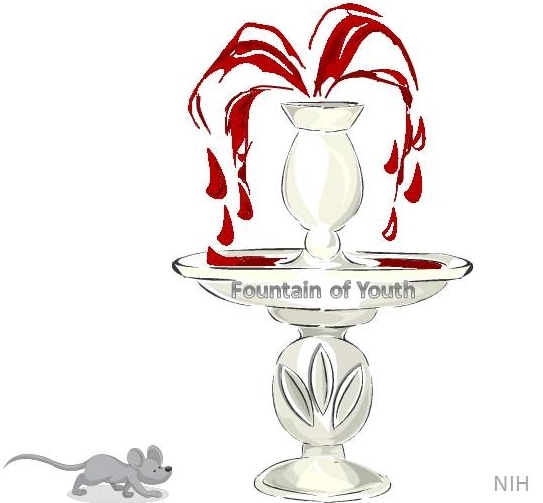 Vascular and neurogenic rejuvenation of the aging mouse brain by young systemic factors.Katsimpardi L, Litterman NK, Schein PA, Miller CM, Loffredo FS, Wojtkiewicz GR, Chen JW, Lee RT, Wagers AJ, Rubin LL. Science. 2014 May 9;344(6184):630-4. There will be research, between Pediatrics and Geriatrics on Blood Donor Information. DNA and RNA will be tested through blood and Urine Drawing with Body x-Rays.